What to do with leftover veggies from making the Cowboy Hash? Fried rice, of course. Since I am currently in the Rachael Ray school of cooking (meaning I buy all her cookbooks, watch 30 Minute Meals, and subscribe to her magazine), I know that she often says that she often provides a cooking method, not just a recipe. One such method can be found in her Special Fried Rice, which is the perfect place to throw the extra veggies from the fridge at the end of the week. 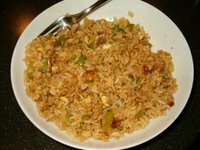 She also has a great Funky Fried Rice recipe in 30 Minute Meals, both of which use the same basic method. I used my leftover bacon, green bell peppers, mushrooms, and sugar snap peas from the week. I also skipped the seasonings for the rice (the garlic and ginger) and used Kikkoman Fried Rice seasoning from the grocery store. Otherwise, I followed the cooking method from the recipe and was darn happy with my results. Heat a wok, wok shaped skillet or large nonstick skillet over high heat. [If you don't have a wok, you should get one! I use this one from Calphalon that is hard anodized so it is nonstick. I swear the fried rice and stir-frys turn out better from a wok than a skillet, but it could be psychological.] Add oil to the pan. [I cooked the bacon first and just used that oil to cook the egg in.] Add egg to hot oil and break into small bits as it scrambles. When eggs are scrambled, add garlic and ginger to the pan. Add carrots, pepper, scallions to the pan and quick stir-fry veggies 2 minutes. Add rice to the pan and combine with veggies. Fry rice with veggies 2 or 3 minutes. Add peas and soy sauce to the rice and stir fry 1 minute more, then serve.